Community-oriented facilities offer a variety of learning experiences and foster educational and vocational achievement for an ever-changing student body. The master plan provides up to 700,000 square feet of renovated and new academic, administrative, student services, and community-serving facilities. 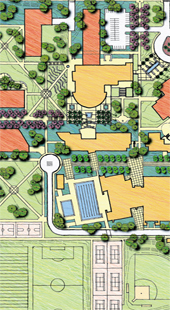 The master plan expands an established open-space network to create a series of small and large courtyards and greens. It turns the previously inward-oriented campus toward adjacent neighborhoods by placing and orienting new facilities along the campus edge, providing prominent open space and pedestrian connections to the street, and creating an overall image of openness and engagement with the surrounding community. 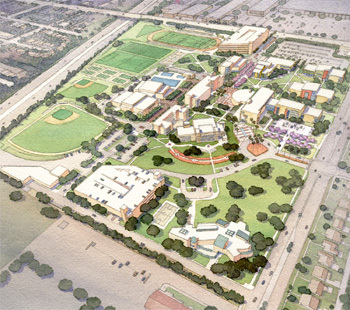 The campus also reaches out to the community by placing more public uses, such as a childcare development center, food services, a conference facility, and a community arts center, closer to the street and public transit. Seismic conditions are a major factor in building location and campus character. This constraint reinforces a pattern of tightly knit, interconnected spaces, creating a compact “urban” campus in an otherwise suburban setting.